It is clear by now (by now, by now, right?) as Goldman Sachs continues to rake in cash and continues to occupy top government roles determining policy, as Oil companies continue to destroy land and fund wars and receive government contracts to do so, as the US is set to offer the management of drone patrols over Iraq to the most corrupt bidder (Blackwater or Haliburton? ), that we are not a people governed by a will to advance the well-being of “the people.” Right? Small examples lead to bigger ones–when we allow “hybridization” of government we are on the way to full privatization. What follows leads the way to the next step in “economics,” or population management–the erroneously named Anarcho-Capitalism. Anarchy posits no hierarchy and people are freely associated as to their will. Capitalism is ONLY hierarchical and ONLY coercive. Being “free” of regulations, the owners will Govern you mercilessly. Here’s a PR release that’s fun and of especial note to the battered citizens of Indiana: “Advisory Council on Privatization and Innovation Holds First Meeting” (excerpted). HThe Governor’s Advisory Council on Privatization and Innovation today held its first meeting, hearing presentations about successful public-private partnerships created in the state of Indiana. The advisory council, consisting of unpaid volunteers from the private sector, was created by Governor Corbett last fall to examine potential privatization, public-private partnerships or managed-competition opportunities with the ultimate goal of streamlining government and reducing costs to taxpayers. Council members are examining state government functions and services to determine whether the state is providing the most cost-efficient and transparent government that taxpayers deserve. Today, council members heard presentations by Cris Johnston, deputy chief of staff to Indiana Governor Mitch Daniels, and Stephen Goldsmith, the former mayor of Indianapolis. Both have extensive experience in executing successful public-private partnerships…. The council will work continuously, meaning it will not sunset. Cris Johnston: Johnston serves Indiana Governor Mitch Daniels as the Deputy Chief of Staff and has led the Government Efficiency and Financial Planning Division of the Indiana Office of Management and Budget for the last seven years. His team is charged with the development of a statewide performance measurement system, identifying and implementing performance improvement opportunities, and coordinating intra and inter-governmental initiatives. Some of these efforts include evaluations of over 400 state government programs, strategic sourcing procurement implementation, and property tax reform. Johnston previously served as Chief Deputy for the State Treasurer. He also was a partner in the Public Sector Services Group of Crowe Horwath LLC, where he worked for 13 years providing financial advisory services to state and local governments. Johnston is a graduate of Wabash College and received his MBA from Butler University. Mayor Goldsmith has previously served as the Deputy Mayor for Operations of New York City, Chairman of the Corporation for National and Community Service and Chief Domestic Policy Advisor to President Bush in his 2000 presidential campaign. He is the author of many books on cities and is frequently published in such papers as The Wall Street Journal and The New York Times. Anything in there sound like it might serve the greater good of all citizens? Just look at the “bio” information of these men. They are in it for themselves and their positions of power and status. I will offer this as my best non-economic, common-sense response to the claim that any of these moves “save” money. This idea of “savings” is a false one. The Government is YOU. The services it performs are supposed to be for YOU (all of you and I know that’s also a troubled contention). Services do cost money. We collectively agree that we want to be governed in a way that creates a reasonably equable quality of living for EVERYONE. When we cut government budgets and then “sell” services to the private market all we are doing is transferring those economics to another party and actually layering in more cost. Further, your taxes IN SMALL percentages of increase can make a huge difference. If we actually taxed corporations none of this would be happening. Finally, private corporations only perform services in a manner that makes them money. “Efficiency” means cutting corners or reducing standards. You cannot review a private contractor’s work in government without discovering this. So, not only do you still pay taxes, but now you have to pay the private company for those services you used to get via those tax dollars. Who’s the winner here? Not you, not Indiana or Illinois or Michigan, but private owners with the means to manipulate our systems. That’s what they’re innovating about, by the way. Also, you can’t vote a private contractor out of office; and it’s very difficult to sue a massive corporation (and even if you can, the cost for you is massive and the cost to them is miniscule). 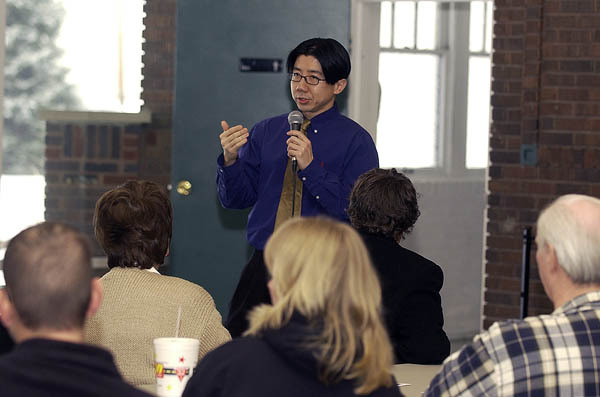 Another example is the Assistant State Superintendent of Public Instruction in Indiana, Dale Chu. Chewytrain, his handle on twitter if you can believe it, is a privateer first and foremost. I’d go so far as to say any ideas that come out of Tony Bennett’s mouth are under copyright by Chewytrain. Here’s is his vitae prior to infiltrating state government in Indiana. Dale Chu is a Director of School Partnerships for Insight Education Group, Inc. He brings a decade of experience as a teacher and administrator in both rural and urban school settings. His background in school administration, as a lead teacher, vice principal and principal, gives him a unique understanding of the multiple demands placed on school leaders and the challenges they face in the high-stakes, high-accountability educational climate of today. Before joining Insight, Dale was the founding principal at Elm City College Preparatory Elementary School in New Haven, Connecticut. Dale led the instructional program, directing and supporting student achievement and school quality. Under his leadership, Elm City raised the number of students reading at or above grade level by 70 percentage points in one year (26% to 96% as measured by the Developmental Reading Assessment). On the 2007 Connecticut Mastery Test, the students of Elm City outperformed the state and the district in math and writing, with proficiency levels of 94% and 87% respectively. His school served as a model for elementary schools statewide and was frequently visited by administrators, politicians, and dignitaries throughout Connecticut. Through his extensive work in public and charter schools, Dale has learned that effective instructional leadership comes down to having strong convictions about best practices and promoting activities that contribute to teaching and learning. The best leaders take the time to cultivate a robust organizational culture marked by collegiality and cooperation. His successes stem from his belief that as the leader, job number one is to do whatever it takes to bring out the very best in his teachers. Dale began his career in education as a Teach for America corps member in San Benito, Texas, a small, rural town located in the Rio Grande Valley along the U.S./Mexico border. He was recognized as the school districts teacher of the year in only his second year of teaching, selected from over 300 teachers. During this time, he launched the first service-learning program in the district: a community beautification/graffiti prevention project targeted at Latino youth. The tremendous success of the program garnered local media attention from around the region. Dale earned a B.A. from Cornell University and completed the Prospective Principals Program at Stanford University, receiving an administrative credential and a M.Ed. in Educational Administration and Policy Analysis. He holds teaching credentials in Texas and California as well as administrative credentials in California and Connecticut. I’m sure Insight is looking for more infiltrators if you’d like to sell out the health and well-being of your community’s children to blackwater schools. What’s important to note here is that a man like this has no commitment to PLACE. Why would this kind of man CARE about your living. He cares about his “success” and his bootlicking approval by his masters (Tony Bennett is the best policy superintendent in the world!, i.e., he let’s me dream my own private world and implement it!). It is this kind of man who does the dirty work; this is Arendt’s Banality. Finally, in perhaps the only example of what might BEGIN to show a way to change this massive coup to occupy every aspect of our public lives (EVERY SINGLE ONE)–occupy a building and perform the services that the state is supposed to perform. I lay this out on the heels of yesterday’s post. WE need to govern our communities. Not Dale Chu, not Cris Johnston, not Stephen Goldsmith, not Mitch Daniels, not Arne Duncan, not the Pentagon, not Barack Obama, not Bill Gates…We are the WE in we the people. How have we come to forget this? I assure you, by design. Chomsky, as always, laying bare the ugly heart of power in 5 minutes. Privitization of Schools: What Faith Are You Funding?